There’s an undeniable churn in the leadership of India's biggest private-sector banks. Chanda Kochhar’s rather unceremonious exit as the managing director and chief executive officer at ICICI Bank means that executive heads of three of India’s four biggest private-sector lenders—Axis Bank and Yes Bank are the others—have either demitted office or are slated to quit in the next few months. Even at HDFC Bank, the biggest of the lot, there will be a change at the top when Aditya Puri retires in October 2020 after turning 70. VCCircle takes a brief look on how the tenures of some of India’s most celebrated bankers have fared. 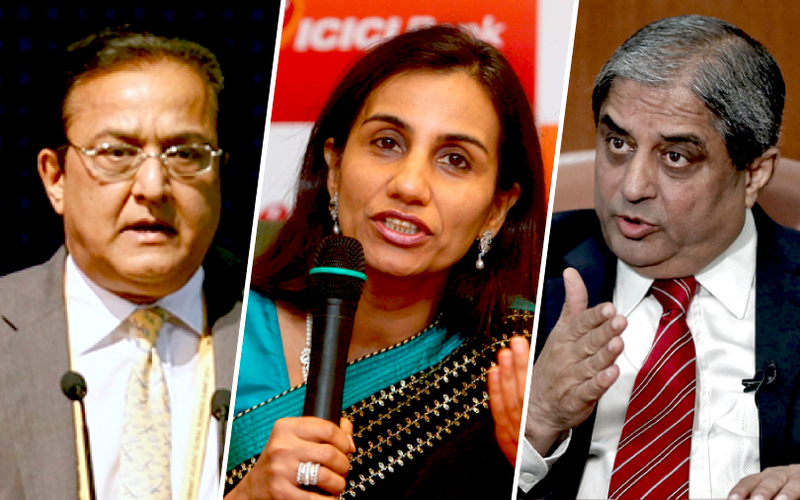 Highlights: Kochhar’s tenure at the helm of ICICI Bank was a mixed bag of sorts. While she managed to grow the bank’s net interest income at a compound annual growth rate (CAGR) of 15.4%, profits took a hit in the last three years of her tenure, as bad loans rose. Between 2013-14 and 2017-18, ICICI Bank’s gross non-performing assets (NPAs) went up more than five times, or by a whopping 50.6% on a CAGR basis. While gross NPAs made up just over 3% of the bank’s assets in 2012-13, they now make up nearly 9%. Controversies: In 2016, a whistleblower shareholder accused Kochhar of favouring her businessman husband Deepak, his brother and Videocon group promoter Venugopal Dhoot in a quid-pro-quo deal. Although it was largely overlooked then, the allegation resurfaced in 2018 and snowballed into a major controversy, eventually leading to her ouster. Highlights: Kochhar’s colleague at ICICI, Sharma took over as the managing director of Axis Bank the same year that Kochhar took over the corner office at ICICI Bank. And her time at the head of Axis Bank has seen the lender go through similar highs and lows—rising interest incomes, declining profits and a burgeoning bad loan crisis. During Sharma’s time, net interest income grew steadily at 18.15% on a CAGR basis, from just over Rs 5,000 crore to Rs 19,000 crore. However, profits have declined sharply in the last two years after a secular uptick in the first six. In 2009-10, Axis Bank’s gross NPAs formed just 1.13% of its asset book. The number was six times as big in relative terms by 2017-18, perhaps why the Reserve Bank of India cut her tenure short by more than two years. Controversies: Apart from the fact the Sharma failed to check the spread of bad loans, Axis Bank came under the media’s glare in late 2018, when, in the wake of demonetisation, several branch managers and other officials were accused of helping wealthy depositors launder large amounts of cash. Highlights: In 2004, Kapoor, along with his brother-in-law Ashok Kapur founded Yes Bank. He effectively took over the bank in 2008 when Kapur was tragically shot dead during the Mumbai terror attacks. Since then, the going seems to have been good for the bank. Publicly available data show that, in the last decade, the bank’s advances have grown at a scorching annualised pace of 36.5% to more than Rs 2 trillion at the end of March 2018. The lender had also surpassed all public-sector banks barring State Bank of India in terms of market valuation, before its shares plunged last month after the RBI refused to extend Kapoor’s tenure. Controversies: Ever since his co-founder Ashok Kapur died, Rana Kapoor has been at loggerheads with his widow Madhu Kapur and daughter Shagun Kapur Gogia. The differences came to a head in 2013 when Madhu Kapur took her brother-in-law to court over the appointment of her daughter to the bank’s board, alleging that she and her children had been denied their rightful place in the bank’s management, despite owning a 12% stake. More recently, the RBI cut short Kapoor’s tenure, ostensibly because it is concerned about accounting practices and standards of corporate governance at Yes Bank. Highlights: Puri is the longest serving chief of any bank in India. But that’s not his only achievement. HDFC Bank surpassed ICICI Bank last year in terms of asset book while also keeping its house in order. The bank’s advances have grown at a compound annual rate of 28% since 2006. Equally importantly, the share of toxic assets on its books has never got out of hand, remaining around 1-1.3% of total assets. Since the turn of the century, the bank’s profits have surged 37 times while its market value has grown nearly 100 fold. The bank has a market value of around Rs 5.3 trillion ($72 billion), a tad less than the combined market capitalisation of Kotak Mahindra Bank, ICICI Bank and Axis Bank.